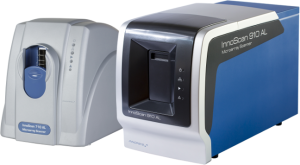 Save time and make analysis of your sample series more convenient: InnoScan 910, InnoScan 710-IR and InnoScan 710 scanners can be equipped with 24-slide loaders for high throughput applications. Speed: with a reading time of 100 minutes for 24 slides, InnoScan AutoLoader is now the fastest scanner on the market. Automation: Insert your slides easily into the loader and configure reading and analysis parameters in a few clicks using the user-friendly and efficient Mapix software. Create different reading and analysis programs for different slides in the same cycle. Functional genomics: CNV, genotyping, DNA methylation. Gene expression profiling. Clinical research: Cytogenetics & IVF. Disease stratification. Industry application: Food contaminant investigations. New drug impact research. InnoScan AutoLoader is a very compact scanner which saves laboratory space. Its frontal loading system, reachable by a vertical sliding door, allows users to easily load/unload up to 24 slides directly with no need of a special slide holder. All standard 3in x 1 in market slides are fully compatible. With the help of several sensors and an innovative gripping system (without tongs or fork), the slides’ physical integrity is ensured during insertion/extraction process.